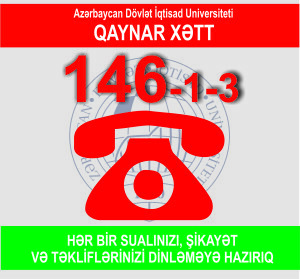 Azerbaijan State Economics University provides the “Hot line” service. To connect with “Hot line” you can call “Hot line” 146 of the Ministry of Education, dial 1 for Azerbaijani language and then select 3 for delivering your complaint or feedbacks about UNEC. Calls via 146-1-3 “Hot line” are free of charge.The essential purpose in the establishment of “Hot line” is ensuring transparency in education process. “Hot line” of ASEU receive calls from 09:00- till 18:00 each workday.